Kings Steakout offers good food in a relaxed family-style atmosphere. The menu is varied and diners are spoilt for choice, but the house speciality remains the succulent steaks, perfectly prepared all the time. King's also serves poultry, pork and seafood dishes. There is an awesome kiddies menu with a difference and the restaurant is fully licensed. 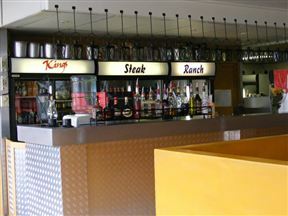 King's Steakout is 1.6km from the centre of Bellville , the nearest airport 8.9km (Cape Town International Airport).